With upcoming models like the next-gen Civic and NSX, Honda is working to return to its performance glory days. We'll see one more manifestation of that desire at the upcoming Frankfurt Motor Show with the Project 2&4 concept. The single teaser image leaves the styling to anyone's guess, but the vehicle is powered by the potent 1.0-liter V4 from the RC213V MotoGP race bike. Stuffing the high-strungmotorcycle engine into the car should at least make a great noise. 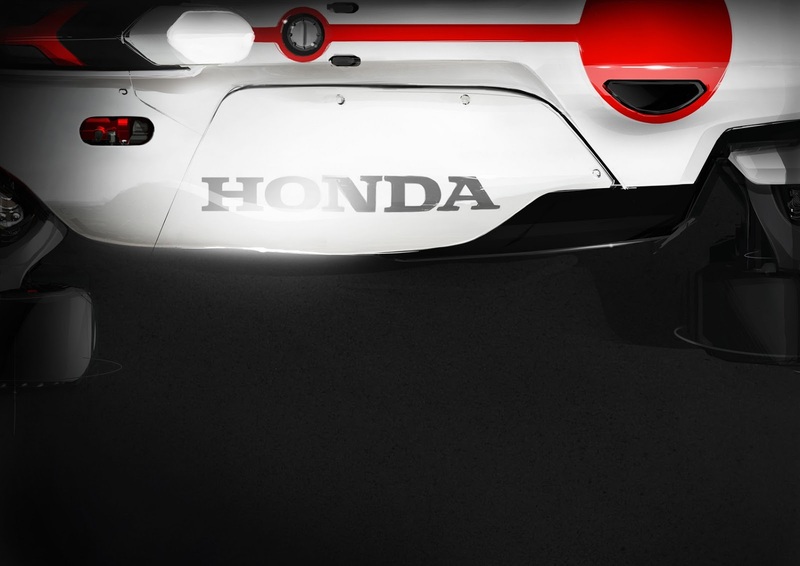 Unfortunately, Honda is keeping the details very scant in the teaser. The Project 2&4 has no cabin and is meant to combine "the freedom of a motorcycle and the maneuverability of a car." That suggests a low-slung, minimalist body with an emphasis on handling, and the image appears to show open wheels at the front and rear. The company also doesn't say whether it has the race bike's full competition engine with over 235 horsepower or the new street version with 157 hp to over 212 hp, depending on the spec. The Project 2&4's shape is the result of a global competition among the brand's studios. The winning design is the result of cooperation from the motorcycle stylists in Asaka, Japan, and the automotive team in Wako, Japan. We're curious to see what it actually looks like in Frankfurt. August 26, 2015 - The 2015 Frankfurt Motor Show underlines an important year for Honda and will see the brand presenting its new model range of entirely refreshed and all-new cars displayed together. Alongside the new line-up, Honda will also showcase design concepts and advanced technologies, all demonstrating Honda's unique creativity in meeting the personal mobility challenges of today and the future. 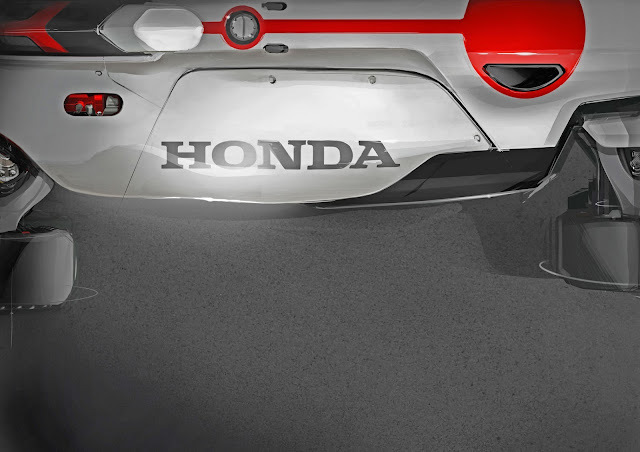 The 2015 Frankfurt Motor Show will witness the global premiere of 'Honda Project 2&4'. A winner of the global design competition run by Honda between its global design studios, Honda Project 2&4 represents the company's drive to inspire and reward creative thinking. Embodying Honda's concept of 'creative craftsmanship,' Honda Project 2&4 was designed together by Honda's motorcycle design centre in Asaka and by Honda's automobile design centre in Wako, Japan. The Honda Project 2&4 is the result of the company's continuous effort to create a more exciting user experience. Honda Project 2&4's cabin-less structure produces an immersive driving environment combining the experience Honda has in providing the freedom of a motorcycle and the maneuverability of a car. 2015 Frankfurt Motor Show will see the all-new HR-V and Jazz models on display. Due to arrive in European showrooms from September onwards, both models combine sophisticated new design concepts with the safety, class-leading interior space and versatility customary to Honda models. One of the best selling SUVs in the world, 2015 has seen Honda's CR-V refreshed for the European market with a new diesel engine and nine-speed automatic transmission, as well as world-first technologies to enhance occupant safety. The 2015 Honda Civic and Civic Tourer feature new sporty exterior and interior styling enhancements, reflected by a new Civic Sport, as well as introducing Honda Connect, an advanced Android-based infotainment system offering WiFi, Bluetooth, USB, HDMI and Mirror Link connectivity. The new Civic Type R is Honda's race car for the road and represents Honda's racing spirit and commitment to delivering class-leading performance through creative engineering. The British-built model, which debuted earlier this year at the Geneva Motor Show, is powered by an all-new 2.0 litter VTEC TURBO engine and is the most extreme model ever to wear the legendary red badge of a Type R. With unmatched performance in the European front-wheel drive hot hatch segment, the Civic Type R's peak power output is 310 PS at 6,500 rpm. Coupled with unique aerodynamics, the Type R can power to a top speed of 270 km/h. During 2015 Frankfurt Motor Show, Honda will demonstrate its personal mobility device, UNI-CUB β. The device features balance control technology and an omni-directional driving wheel system (Honda Omni Traction Drive System) which originated from Honda's pioneering research into humanoid robots, represented by the research and development of the world's most advanced humanoid robot, ASIMO. The Honda Press Conference will take place at 14:00 CET on Tuesday 15th September on the Honda stand B11 in Hall 9.0.